Stefanos with his parents Apostolos and Julia (Credit: IG/stefanostsitsipas98). If you’ve followed Stefanos Tsitsipas’ ascent to the top-15 this season, read his posts on social media, heard him talk in interviews, or watched his travel vlogs on his Youtube channel, you’re probably wondering how a 20-year-old tennis player can be so pensive and philosophical. A few minutes of chatting to his parents, Apostolos — who is his coach — and Julia — who was a top Soviet player in the 1980s and is currently also coaching — will quickly explain where he gets it from. Tsitsipas, who is wrapping up his career-best season as the top seed at the Next Gen ATP Finals in Milan this week, rocketed up the rankings from 91 in the world at the start of 2018, to his current position of No. 15. 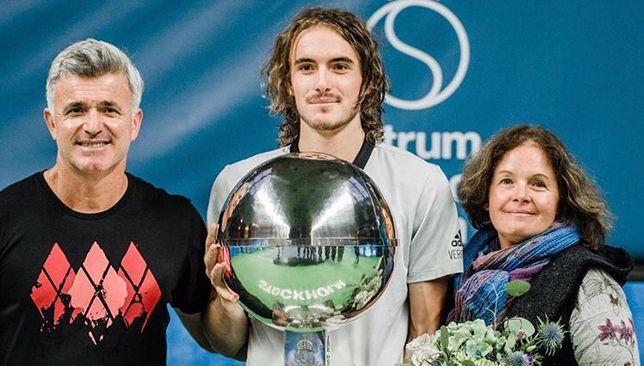 The tall Greek with the Bjorn Borg-like locks is the youngest player in the top-25 and arguably the most unique. On the court, he won over the tennis world with his big game, fluid single-handed backhand, explosive dive volleys, and fun interactions with the crowd. Off the court, Tsitsipas spends his time filming and editing his quirky travel vlogs (his Youtube channel has more than 10,000 subscribers) and taking photos which he posts on his alternative Instagram account, with the handle ‘stevethehawk’. On that account, he describes himself as a “world explorer” and “abstract photographer”. He takes snaps from all the cities he visits throughout the year, and captions his posts with inspirational quotes or philosophical remarks. “The voyage of discovery is not in looking for new landscapes, but in looking with new eyes,” Tsitsipas posted a couple of days after his early exit from the Cincinnati Masters. “Don’t avoid things that are going to make you a more experienced individual,” he posted from Shanghai. “All that is important is this one moment in movement. Make the moment important, vital, and worth living. Do not let it slip away unnoticed, unused,” he captioned one of his images from the streets of New York City. His parents admire his individuality and the time and effort he puts into his off-court passions, although his mother, Julia, admits she isn’t as philosophical as her son. “I am more practical,” she told Sport360 in Milan. Apostolos believes his son’s photography and vlogging has deeper meaning than simply being an outlet to blow off some steam off court. “He wants to give to the society something back, and he’s giving back through the vlogs. He started too early actually in his life,” he explains. “He even asked me to do a foundation. He already did a campaign during the fires in Greece. He was helping a lot of people, although he didn’t have the money to do it. He was trying to find a way to raise awareness and funds. And he did it. “And that week I was with him, he was spending like 10 hours a day trying to do this job, and trying to send the money to Greece, but it was difficult because of the crisis, the banks accounts were blocked and he was trying through connections he had through ATP, it was amazing. “He had to play semis against [Alexander] Zverev in Washington, and he was one hour before on his computer trying to do this job. And then he went to Toronto and he was still trying to do this and finally he managed it before he played the final in Toronto. It’s fair to say that not all of Tsitsipas’ peers fully understand what he’s about. Nick Kyrgios even mocked his vlogs on social media but Apostolos believes his son is unaffected by it all. “Nick Kyrgios, it’s very difficult for him to do this kind of job, because this job takes all your free time. For Stefanos free time means I do something that helps me to be creative, helps me to be balanced. That’s what helps him,” says Apostolos. The aforementioned week in Toronto saw Tsitsipas march into the final by upsetting four top-10 players back-to-back – Dominic Thiem, Novak Djokovic, Zverev and Kevin Anderson – before succumbing to Rafael Nadal on what was the young Greek’s 20th birthday. “It never gets easier. You just get better,” Tsitsipas wrote on the camera lens after he defeated Anderson to make his first Masters 1000 final. Apostolos was at a loss for words when asked to explain how his son pulled off that run in Canada. “I can tell you that made me really impressed. If I stop to analyse this, it’s unbelievable strength. He was really inspired there,” said the 50-year-old. Apostolos says he predicted at the start of the year that his son would finish the season inside the top-20 because he felt he was finally physically ready to make the leap. Tsitsipas made three ATP finals in 2018, winning his maiden title in Stockholm. Julia is proud of Tsitsipas’ development but is reserved when it comes to praising him. “I think the progress was good. In terms of physical, mental he impressed me maybe the most. How he was observing his success himself, that’s what impressed me the most. He was humble and from the other side he was very decisive, so this combination is great,” she says. Tsitsipas plans on spending part of his preseason preparations in Dubai, where he is set to practice with Roger Federer in December. He will be in a different position next year, as he starts off as a top-15 player with a target on his back. Asked what she thinks he should work on to prepare for the challenges ahead of him, his mother said: “He can’t do really much in terms of physical or technical improvement. I think he should be more aware of how to accept his losses because they are going to come. Because still sometimes his reaction is still childish, it needs work. Tsitsipas could be on holiday right now if he wanted to but he chose to honour his commitment to the ATP and compete in the Next Gen Finals, even though he is closer to the ATP Finals field in terms of ranking, than he is to the No. 2 seed here in Milan, where seven of the best 21-and-under players are competing, along with an Italian wildcard. While there are no ATP points on the line, an undefeated champion can walk away with a handsome sum of $407,000. Zverev and Denis Shapovalov have both opted out of the event. “For him, because last year he didn’t play, he was here as an alternate. He didn’t feel well. So I asked him, ‘Just decide, you want to play or you want to skip and start your holidays?’ He told me, ‘Maybe I try. Maybe I can help the event’,” says Apostolos. Tsitsipas was first introduced to tennis via both his parents and his father travels with him as his coach throughout the year. Sport runs deep in the family. Besides the fact that both Apostolos and Julia played tennis, Julia’s father, Sergei Salnikov is an Olympic gold medallist footballer, and used to coach Spartak Moscow. “I think at this point, Stefanos is blessed. Having both parents in tennis. You see nowadays, you see more and more tennis players with parents behind them, not the system but the parents. And that’s what the system has to replace probably. I don’t know how. The system probably can involve more the parents in their development,” says Apostolos. “I’m talking about the emotional balance of the kids. Because the kids, when they leave the house and they have to follow the independent life direction of professional life, it’s not easy. To be away from the family, secure, everything ready and then they have to go to the tour at 16 or 17, we believe they’re already grown up because they’re tall and big but still they’re sensitive and they still have this child inside. That’s not easy. There, maybe, the system can combine with the parents. Mostly the system says the parents should stay away, they distract them. Stefanos Tsitsipas is not a fan of the new towel racks introduced at the Next Gen ATP Finals nor is he a supporter of on-court coaching. On-court coaching has been a hot topic as of late and it was brought to the fore even more when Serena Williams’ coach Patrick Mouratoglou wrote an op-ed piece listing all of its advantages and calling for its introduction to all events. Tsitsipas, who trains at Mouratoglou’s academy, doesn’t share the Frenchman’s views and insists he prefers to fly solo during his matches. On-court coaching has been in place on the WTA tour for nearly a decade, and is one of the new rules tested out at the Next Gen ATP Finals. Unlike the women’s tour, coaching is done via headsets at the Next Gen ATP Finals, and coaches are obliged to talk to their players in English. “The coaching on court I’m really not a big fan of, to be honest with you. I think the player should find solutions by himself. I don’t really like to talk when I’m playing on the court,” Tsitsipas told reporters in Milan on Tuesday following his 4-3(5), 4-3(3), 3-4(4), 4-2 victory over Jaume Munar. Tsitsipas is coached by his father, Apostolos, and the young Greek was asked if his father felt the same way about on-court coaching. “Probably the opposite,” he said with a laugh. “I’ll tell you something. I don’t really like talking and having discussions about my game. I want to focus more on what I have to do better to break my opponent or win the next game. Towel racks were added to the Next Gen Finals court this year to avoid ball kids having to handle dirty towels and place the onus on the players to fetch their own towels and manage their time better between points. “One thing that I didn’t like that much was the towel thing. I was always had to run for the towel, always had it in my mind when I was playing,” said Tsitsipas. The world No. 15 added: “Today I was confused myself. I started with one side, then I completely forgot that I have to take it. “I was saying to one of the physios just before I walked in here that it would be very nice to have two boxes on each side with each player’s name so you can just go there and leave your towel on one side and have another one on the other side. So like this, you are covered. Last year’s Milan runner-up, Andrey Rublev, admits he forgot to take his towel back to is bench after the third set of his five-set win over Taylor Fritz and says on-court coaching is “not real” because coaches are reluctant to reveal too much information that could later be used by rivals. Rublev, who is the only repeat visitor to the Next Gen Finals, has his own set of reservations about the format and new rules of the competition. “Like I said always that I’m not a big fan of these rules. I think it’s a little bit not fair because, in the end, everything makes no sense,” said the Russian. “It’s not the same physical. You don’t need to be strong. Even if you play so you don’t feel nothing today and the other guy is playing so good, you still can win the match, which is not happening normally when you play the real match. And I think this is little bit not fair because the other guys, they have little more chances to win always. “Look, for example, the match today of Tsitsipas that make amazing season beating top players, and now — I’m not saying nothing bad about Munar. 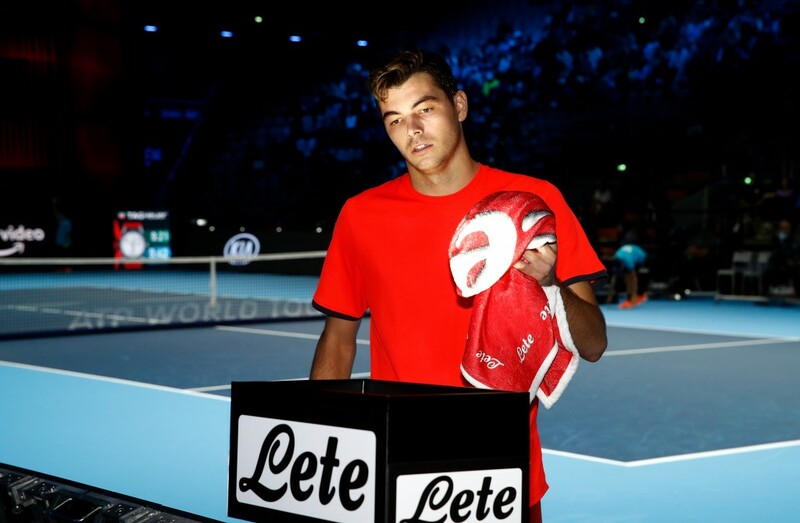 “But he’s top 15 and Munar is, I think, 80, 90 in the world, which looks like normally Tsitsipas supposed to win, like, not easy but with confidence, and the match was so close. The third match of the day saw Frances Tiafoe overcome Hubert Hurkacz 4-1, 4-2, 2-4, 4-3(10). How well does Frances Tiafoe know his fellow Next Gen ATP Finals contestants? Frances Tiafoe has been the life of the party so far this week at the Next Gen ATP Finals in Milan, cracking jokes and messing around with his fellow contestants. But how well does the American actually know his rivals in the 21-and-under tournament? We put Tiafoe to the test and he surprised us with his knowledge. The world No. 40 begins his campaign at the Fiera Milano on Tuesday against Poland’s Hubert Hurkacz (19:30 local time, 22:30 Dubai time).